SOCHI, Russia (CNN) -- Russian Prime Minister Vladimir Putin has accused the United States of orchestrating the conflict in Georgia to benefit one of its presidential election candidates. 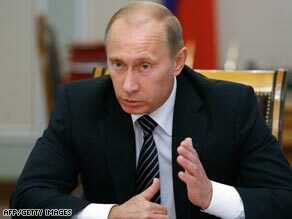 Russian PM Vladimir Putin has accused the U.S. of orchestrating the conflict in Georgia. In an interview in the Black Sea city of Sochi on Thursday, Putin said the U.S. had encouraged Georgia to attack the autonomous region of South Ossetia. Putin said his defense officials had told him it was done to benefit a presidential candidate -- Republican John McCain and Democrat Barack Obama are competing to succeed George W. Bush -- although he presented no evidence to back it up. White House spokeswoman Dana Perino blasted Putin's statements, saying they were "patently false." U.S. State Department deputy spokesman Robert Wood concurred and labeled Putin's statements "ludicrous." "Russia is responsible for the crisis," Wood said in Washington on Thursday. "For the Russians to say they are not responsible for what happened in Georgia is ludicrous. ... Russia is to blame for this crisis, and the world is responding to what Russia has done." The former Russian president, still considered the most powerful man in the country, said he was disappointed that the U.S. had not done more to stop Georgia's attack. Putin recalled that he was watching the situation in Georgia and South Ossetia unfold when he was at the opening ceremony of the Beijing Olympic Games on August 8. He said he spoke to U.S. President Bush, also attending, who told the Russian prime minister he didn't want war, but Putin spoke of his disappointment that the U.S. administration didn't do more to stop Georgia early in the conflict. Also Thursday, Putin announced economic measures that he said were unrelated to the fighting with Georgia. Nineteen U.S. poultry meat companies would be banned from exporting their products to Russia because they had failed health and safety tests, and 29 other companies had been warned to improve their standards or face the same ban, Putin said. Putin said Russia's health and agricultural ministries had randomly tested the poultry products and found them to be full of antibiotics and arsenic. Russia is trying to counterbalance mounting pressure from the West over its military action in Georgia and its recognition of the breakaway regions of Abkhazia and South Ossetia. But Russia's hopes of winning international support for its actions in Georgia were dashed Thursday, when China and other Asian nations expressed concern about tension in the region. "The presidents reaffirmed their commitment to the principles of respect for historic and cultural traditions of every country and efforts aimed at preserving the unity of a state and its territorial integrity," the declaration said, The Associated Press reported. "Placing the emphasis exclusively on the use of force has no prospects and hinders a comprehensive settlement of local conflicts," AP quoted the group as saying. Russian President Dmitry Medvedev had appealed to the group at a summit in Tajikistan on Thursday to support its actions, saying it would serve as a "serious signal for those who are trying to justify the aggression." On Wednesday, a U.S. ship carrying aid docked in Georgia, while Britain's Foreign Secretary David Miliband traveled to the Ukraine, which is worried about Russia's intentions in the region, to offer the UK's support. Miliband equated Moscow's offensive in Georgia with the Soviet tanks that invaded Czechoslovakia to crush the Prague Spring democratic reforms in 1968, and demanded Russia "change course," AP reported. iReport.com: Do remember the Cold War?